Synesthetic Experiences - Involuntary & Consistent? Synesthetic Experiences – Involuntary & Consistent? Curious as to whether or not you have synesthesia? Looking for a synesthesia test to validate your suspicions or put them to rest? That’s all well and good. While our test is still in development, there are a few litmus tests (or questions, rather) that you can ask yourself before moving forward. The first of which is: Are my synesthetic experiences involuntary and consistent? Now, I realize that this question is quite ambiguous (in that it can be interpreted in a few different ways), so we’ll use the rest of this blog post to define each of these terms and clear up any misconceptions. Let’s get to it! As there are two definitive elements to this question, we’ll address each individually. First up is the term ‘involuntary’. If experiences are involuntary, they aren’t a result of will, purposeful association, or mnemonic aptitude. In other words, you aren’t “trying” to experience or perceive something a certain way. Also, the experience usually isn’t one that’s naturally intuitive. For instance, if you associate the number ‘2’ with the letter ‘B’, it likely isn’t indicative of synesthesia. ‘B’ is the second letter in the alphabet; it only makes sense. If, however, your experiences are triggered involuntarily (or by some external factor – separate from your own will), you may pass GO, collect $200, and spend it as you please. Maybe buy a loved one something nice for Valentine’s day – I don’t know; just an idea. The consistency of your experiences can also be very telling. Neurologist and renowned synesthesia researcher, Richard Cytowic lists the following as one of the main criteria for identifying synesthesia: “Synesthetic percepts are consistent and generic.” The example that I use (probably too frequently) is the case of a true grapheme-color synesthete – for whom each letter in the alphabet triggers a given color in his or her mind’s eye. Now, each time the letter is physically seen, the synesthete perceives it as having one color – a color that is consistently and involuntarily associated with the particular letter. If the letter ‘A’ is red, it is always red. If ‘Z’ is yellow, it is always yellow. That’s consistency. Since I’ve opened the ‘generic’ can, I’ll explain that, as well. The term ‘generic’ refers to percepts that are simple, rather than extravagant. For instance, when a given synesthete hears a certain tone, he or she might picture a black square in space. For another tone, perhaps an orange square is visualized. Notice the pattern? The shapes are simple, or generic – not grand visualizations of colors dancing around in harmony. While this concept has been disputed (and there are always exceptions), it’s certainly worth considering. Now that I’ve explained the question (or disambiguated it, if you will), ask yourself again: Are my synesthetic experiences involuntary and consistent? If not, well, you’re with the other 198 of us out of a 200 person sample size. If so, you might want to seek out more information about the condition. Either way, this is a great place to start. If you enjoyed this post, please stop back! We’re in the process of developing an interactive test for synesthesia and would love it if you were around for its release! 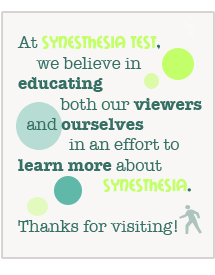 Follow us on Twitter for updates @SynesthesiaTest. Farewell, friends. My concurrents to music can be very extravagant or very simple. 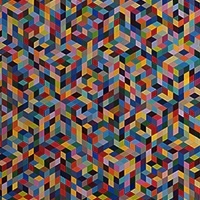 Some are literally colored shapes dancing around complex grid patterns. Others are simple black and white patches. Some are so complex, they defy my ability to sketch or paint them accurately. So some synesthetes may only see simple shapes, but others do not. I still feel my concurrents meet the criteria of being generic because they are made up of shapes, colors and grid patterns, spirals, etc. I’ve always noticed that each number and letter would have its specific color and personality and recently I have been really interested in synesthesia when I found out one of my friends also had synesthesia. When I read the book by Wendy Mass: A Mango Shaped Space, that’s when I found out that there was a name for it. I researched it and found out that I have (and this is what I know for sure) Grapheme-color, Spatial Sequence, Misophonia, and Auditory-tactile Synesthesia. I thought it was so cool, but when I tried to explain it to my friends, it became frustrating and started asking questions like, “What’s the color of my name?” or asking what color for what number/letter and I would tell them, but then my friends would argue over what color to what number/letter when I was pretty positive they didn’t have synesthesia. When I hear noises or listen to music, each individual tone and note and pitch has its own color and shape in my mind, I don’t actually see it, like I could reach out and touch it, no. But I listen to music all the time and like, music with a lot of bass and beats would have darker colors while more classical music would have brighter colors. Some songs have both or just dark or just light. All the noise at the lunchroom during school is filled with browns and greens, but mostly yellows and oranges. I think its pretty cool and I want to learn more and tell my buds, but it becomes really confusing for them and frustrating for me. I love that each number and letter has a color and every word, ect. I think its pretty awesome! I dont really agree with the consistent thing, though. Because even though every letter always has its own color and every number does, but when Im in a negative mood or something, the words’ colors would change. Also, I might add, pain also has color for me. When I stub my toe or something, I would see yellow or orange in my mind depending on how bad in hurt. Once time when I was ice skating and I fell and hurt my shoulder, I saw gray dots all over my mind. I was wondering if anyone else has pain-colors, too? Um, does anyone here know if seeing a light yellow or some other color literally ON something that’s black or white (ceiling, black paper, etc.) has anything to do with synesthesia? I see that, as well as when I’m reading I’ll see yellow dancing around on/between the letters on the paper (if the paper’s white, and the letters are black). And when it comes to graph paper, those lines have to be blue or something! I can’t concentrate with all that yellow running around! Any answers (please)?